Successfully Added iPhone and iPod Ultra Portable Battery Charger to your Shopping Cart. iPhone and iPod ultra portable battery charger for a convenient backup power supply when you are out and about during your busy day. This highly styled battery for your portable iLife device (iPod and iPhone) allows easy powering and recharging convenience when your are away from home. Add this I-Phone and I-Pod portable battery charger to your collection of mobile phone accessories, it will certainly come in handy. A great wholesale price makes this product perfect for the resale market, OEM market, or personal/company use. As always, it is available direct to you from the original source for wholesale direct from China electronics, Chinavasion. While the CVFK-G16 is actively charging your iPhone or iPod you will still be able to make and receive calls as well as listen to music. 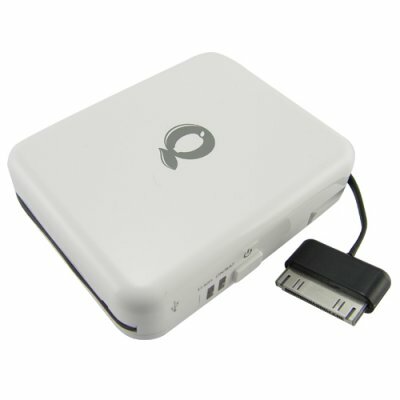 Make your life easier; fully charge the portable charger and keep it in your laptop or hand bag. This portable battery charger hardly takes any space and matches the I-phone and I-pod design. How long will keep my music bumbin while connected to my iphone/ipod? Once the Iphone / Ipod charger is fully charged, connect your ipod or iphone to the charger even when your iphone or ipod battery is depleted and it will play your music an additional 90-120 minutes (approx).